Design a decorative holiday display using at least 5 items purchased from a Goodwill of Delaware & Delaware County store, December 6, 2018 – January 2, 2019. Keep in mind that you can use as many items as you wish in your holiday design – a combination of new, pre-loved, borrowed and items you already own as long as 5 different items on your design were purchased at Goodwill of Delaware & Delaware County. * Be sure to keep your receipt/s. 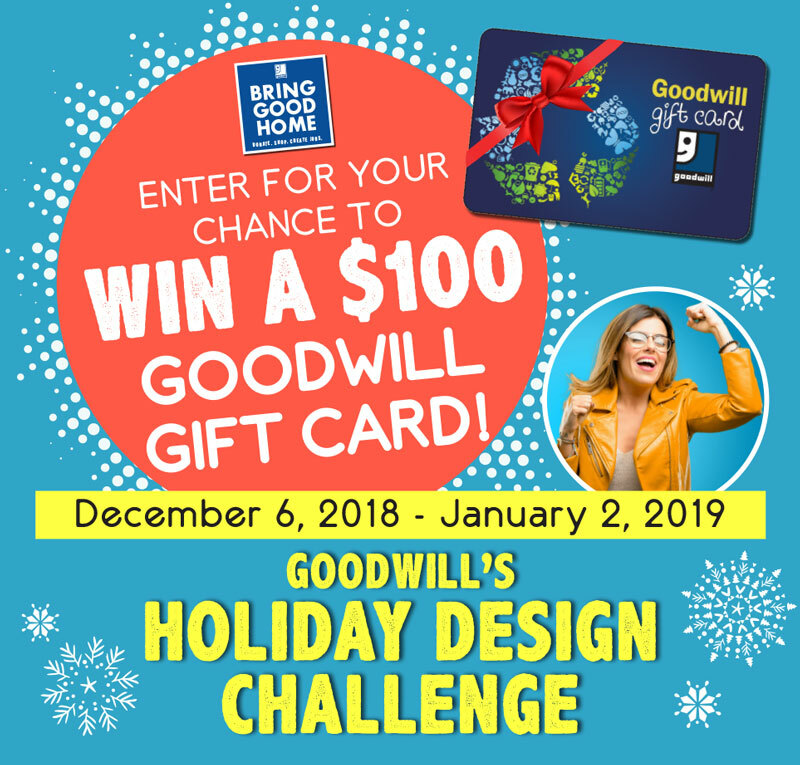 You must be able to produce a receipt from a Goodwill of Delaware & Delaware County location showing the 5 Goodwill items you used in your holiday design purchased December 6, 2018 – January 2, 2019. Keep in mind that you can use as many items as you wish in your holiday design – a combination of new, pre-loved, borrowed and items you already own as long as 5 different items on your design were purchased at Goodwill of Delaware & Delaware County. * Keep in mind you must use #GWHolidayThriftChallenge for us to see your submission! *Only one photo per entry, so if you have more than one photo, please stitch them together using a photo editor. * The contest is open to customers of Goodwill of Delaware & Delaware County stores who are 18 years of age or older on or before December 6, 2018. * Goodwill of Delaware & Delaware County employees are not eligible to enter. *We reserve the right to make changes to the contest at any time for any reason. * Entering into the Holiday Design Challenge grants Goodwill of Delaware and Delaware County the permission to use the photos submitted into the contest on any social media, website, or print material. * The promotion is in no way sponsored, endorsed or administered by, or associated with, Instagram or Facebook. * Finalists will be voted on by a Goodwill team member and the winner will be contacted beginning on January 4, 2019.